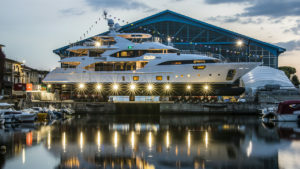 The ninth Benetti Crystal 140 unit, a 42-metre superyacht in the Class product line, was launched at Benetti’s facilities in Viareggio on June 23rd. First introduced in 2011, Crystal 140 is built from composite materials and is the flagship in the Classic category. Measuring 42 metres in length and featuring a 9-metre beam, the yacht offers plenty of space above and below deck. The layout extends over four decks, providing accommodation for 12 people across five cabins, plus the full-beam master suite. The master suite is located forward on the main deck, which is appointed with a private bathroom and offers an impressive 180-degree view of the surrounding seascape through long windows flooding the interior with natural light. The main deck is the true heart of the yacht and has a spacious living area linking the interiors and exteriors through a sliding glass door. The layout of the stern area is highly original: the garage for the tender, jet ski and water toys has been moved forward and given a side entrance. This solution makes it possible to devote the entire stern to a huge beach area, completely free of all equipment. The same rational management of space and the engine room also translates into big, welcoming guest cabins on the lower deck: on the left two sliding beds with pullman beds, and on the right a double cabin with an additional single bed. The same deck also accommodates the crew, while the captain’s cabin is on the upper deck, next to the bridge. Two CAT C32 Acert engines give the yacht a range of over four thousand nautical miles at a cruising speed of 11 knots. This makes it the ideal yacht for long, relaxing ocean cruises.